I got the crafting urge this weekend and decided to make something fun, fresh and springy! At least something that felt springy to me :). 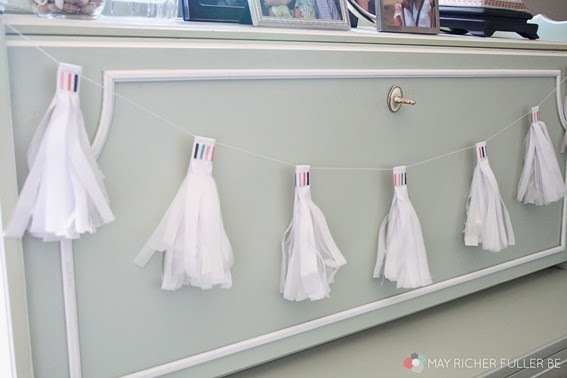 I've always loved those tissue paper tassel garlands you see gracing the edges of tables at parties and showers, but haven't ever tried my hand at one...until now! These are so easy, y'all. Even if you don't consider yourself "crafty" you can make these (and impress all your friends). 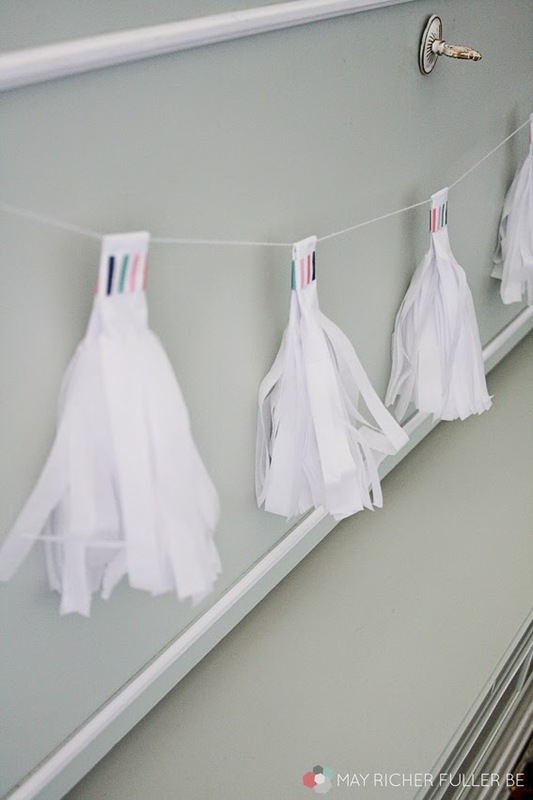 They're simple and inexpensive party decorations - or just a fun touch for your own home! Follow the photos above from left to right, top to bottom. 1 | Fold one piece of tissue paper in half and then in half the other way. The direction really doesn't matter. I actually ended up folding mine a third time so I didn't have to make as many cuts. 3 | Cut narrow strips from the bottom toward the two large folds, leaving about 1" uncut at the top. This will create the fringe. 4 | Unfold the two pieces of fringed-out tissue and lay one on a surface so that the fringe lays flat. 5 | Roll the tissue along the uncut middle crease. 6 | Fold the rolled up tissue in half along the middle to create a loop for hanging. 7 | Place a piece of washi tape around the top near the fold to hold the tassel together. 8 | Repeat for as many tassels as you need to make a garland. 9 | String the finished tassels along a piece of twine, string, yarn - whatever you have handy! I used embroidery floss. 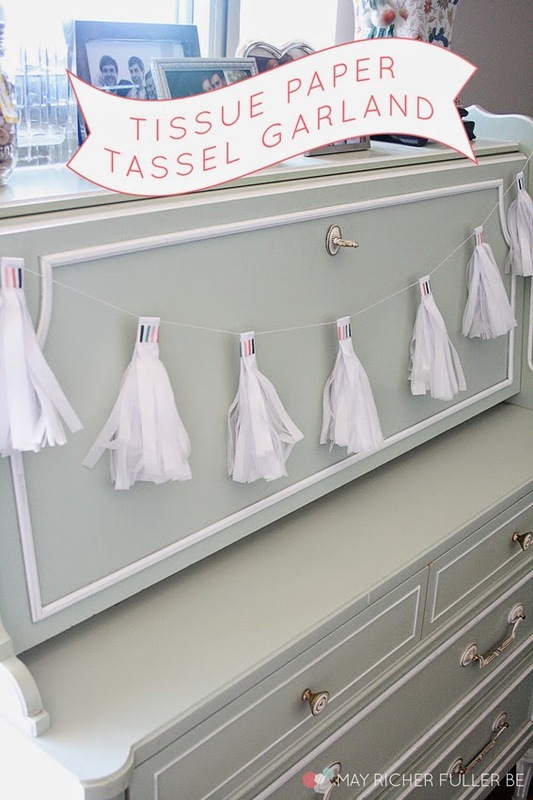 These tassels are so easy to make and you can customize them however you want. I debated leaving them plain white (aren't they pretty like this?!) and twisting the tops to hold them together when I strung them up, but I thought the washi tape gave it such a fun little dose of color. They're so festive! I love this pretty, multi-colored striped washi tape. 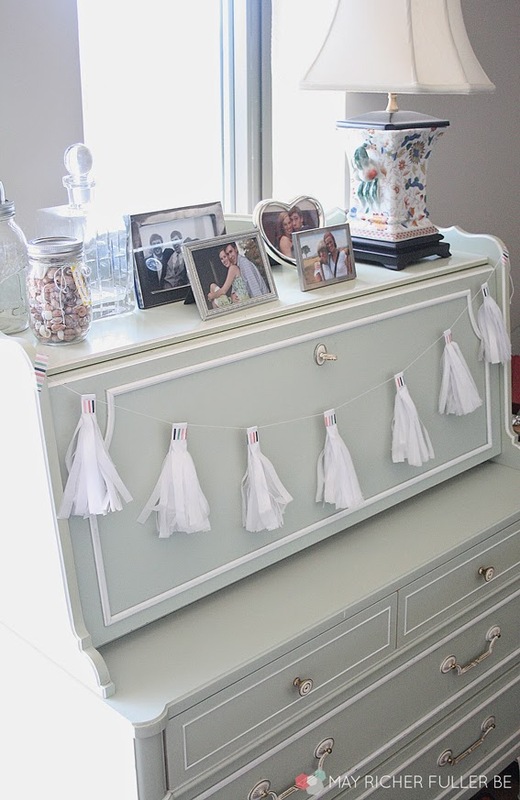 If I ever make one of these for a party, I'd definitely like to add in some other colors of tissue paper. The white fits my thoughts on decorating this spring though - keep it simple! Given that we're moving in 30 days, that's about all I've got to give on that, ha! How about y'all? 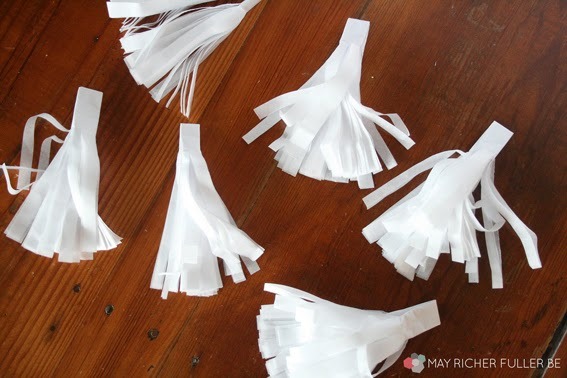 Are these tissue paper tassel garlands on your list of easy party (or home!) decor? If not, they should be. I loved making this, and I would definitely make them again in the future!